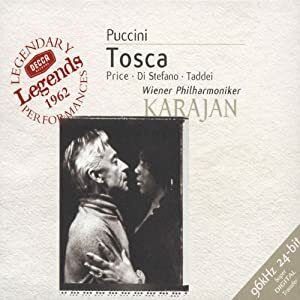 Not only is Leontyne Price light on the drama on the Karajan Tosca- but Karajan's 'handling' of Act II is, I'm afraid to say, dramatically uninspiring as well. I have in mind particularly Karajan and Price's treatment of "Orsù Tosca parlate"- which for me is one of the ne plus ultras in all of opera if its done with the dramatic intensity of Callas and De Sabata- which of course, no one seems to be able to remotely approximate. I do love the stellar Decca sound of the Price/Karajan recording though- and Price's "Vissi d'arte" is gorgeously and full-throatedly sung, if a bit weak in the coloring and dramatic inflections. This one comes in I believe three different packages, and beware there is another on with Doming also. Sound is nice but drama is essential. I can handle suboptimal sound. I can never handle boring singing. If I had to choose only two Toscas. . . . . . . . well, you know the rest. For DVD the Pappano is outstanding although I wish Terfel had had his hair cut! That is a really beautiful cover image! Last edited by Fritz Kobus; Oct-19-2015 at 17:41. 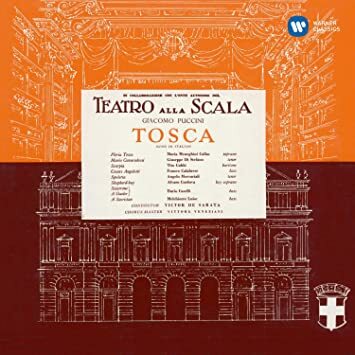 I think I would choose the live 1964 Callas Tosca over the studio recording, but wouldn't be really happy unless I could have both studio recordings, the live 1964 AND the live Mexico City from 1952 as well. Last edited by The Conte; Oct-19-2015 at 21:55. Florestan, no one has asked the obvious question. Why do you have to get rid of any at all? Keep them. Less brilliant accounts (and every single one is less brilliant than the Callas-Gobbi-Sabata version) help you appreciate the more brilliant ones. It stops you taking them for granted. Guess I better go on a Tosca listening spree before I make any decisions. In what way ruined ? Could you elaborate? Did you end up getting all of the arsvocalis Callas remasters, Dark Angel? - You know I did. Last edited by Marschallin Blair; Oct-20-2015 at 20:56. I found the sound synthetic and intrusive. - To each our beautiful own though.